Participation barriers may exist for Muslim women in Australia when participating in sporting activities. These may include the lack of provision of appropriate venues and opportunities that allow culturally appropriate clothing to be worn and the lack of provision of female only environments for participating in active recreation. These constraints can influence the ability of Muslim women to participate in swimming and life saving activities at public swimming pools and at the beach. In addition to these cultural and religious constraints Muslim women have also suffered significant discrimination following the September 11 attacks and the Cronulla riots in December 2005. 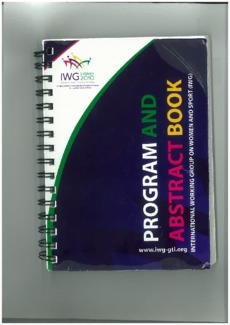 Two case studies of aquatic sport and recreation organisations which promote cultural diversity and gender equity are investigated and presented here to illustrate how Muslim women overcome barriers to participation and create sporting opportunities by developing a sense of belonging and by cultivating relationships and social networks. The research includes in-depth interviews with stakeholders within community sport organisations as well as with key community advocacy organisations. The two case studies include: Royal life Saving (i.e. The Muslim Aquatic Swimming Program) and Surf Life Saving Australia (i.e. The On the Same Wave Project). Findings have demonstrated cultural and gender related accommodations occurring within the case study organisations, facilitated by the development of social and inter ethnic trust amongst participants and community members, encouraging Muslim women to become involved in aquatic recreation activities.